I was unable to find the Russian font to connect within Blender, so I ended up creating an image of the Russian word and used that in place of the text. I am working on a narrator character, so I can step into the comic instead of being a disembodied voice. The real fun starts when I can get some other interesting characters completed. Then we can have more involved interactions. 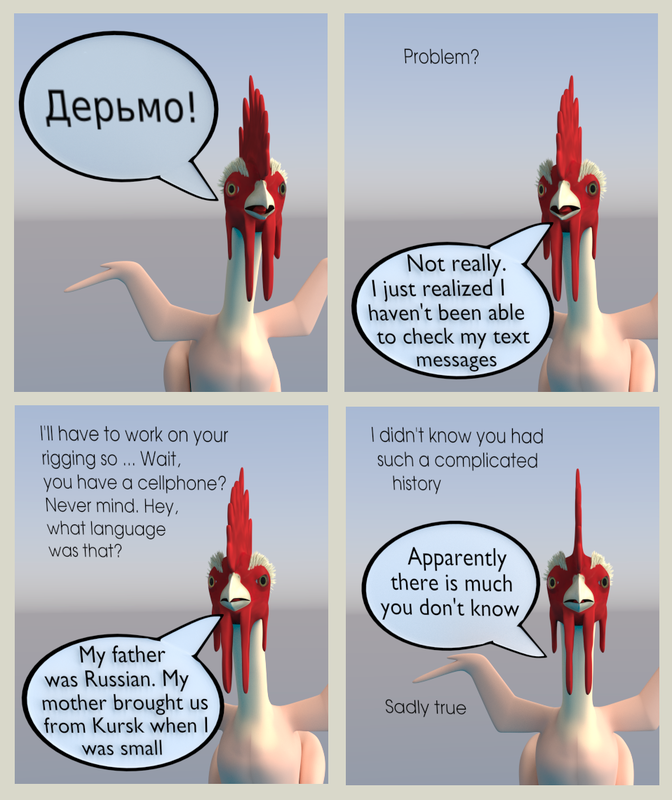 Thatch: Not really, I just realized I haven’t been able to check my text messages. Chiefy: I’ll have to work on your rigging, so… wait, you have a cellphone? Never mind. Hey, what language was that? Thatch: My father was Russian. My mother brought me from Kursk when I was small.